Halloween Ice Creams - Do You Know The Muffin Man? Tangerine Carrot Sorbet: Recipe adapted from about.com. Notes: Substitutions: regular carrots instead of baby; orange-tangerine juice instead of orange; vodka and tangerine zest instead of tangerine liqueur. It's reminiscent of an orange popsicle, the carrot flavour is quite muted, but it's way WAY too sweet. Bright colour. 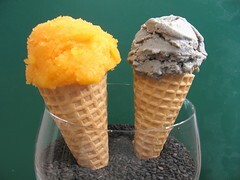 Black Sesame Ice Cream: Recipe loosely adapted from Nobu, the cookbook. Notes: I heated 2 cups milk with 1 cup cream and added that to 4 egg yolks, ½ cup sugar and 6 tbsp. of sesame paste. Return to heat until slightly thickened, cool, churn, etc. The sesame paste was made by combining instant black sesame powder with a bit of hot water. For additional flavour, I also added a bit of vanilla, and some toasted and ground black sesame. Not as dark coloured, or strongly flavoured as I hoped for.